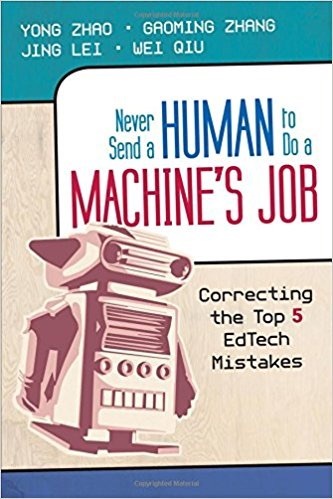 Never Send a Human to Do a Machine’s Joe: Correcting the Top 5 EdTech Mistakes by Yong Zhao, Gaoming Zhang, Jing Lei, and Wei Qiu explores the fact that technology hasn’t transformed education as much as it has transformed other sectors. Here the authors point out the reasons and suggest a new approach. The authors have recognized five basic mistaken approaches and devote a chapter to each. The first is that technology could replace teachers rather than replace just certain functions. The second is the focus on using technology to consume information rather than as a tool for creating authentic products. Third is the focus on using technology to prepare students for standardized tests. Next is using the technology as curriculum rather than teaching digital competence. Finally, professional development usually focuses on teaching teachers how to use new tools rather on the needs of students. In the final chapter the focus is on redefining the relationship between humans and machines with a thoughtful analysis of what humans do best and what should be relegated to technology. In a hierarchy approach, one looks for something better to replace the status quo. In education, there have been hopes that emerging technologies could replace teachers. In an ecosystem approach, the effort is to see what each component does best. In other words, teachers need to find their niche doing things they do better than technology. Teachers can solve unstructured problems, work with new information, and carry out non-routine tasks. They can also deal with social and emotional interactions. The big role for technology is to help the teacher personalize instruction. This involves using technology to assist in diagnosis and to provide a pallet of tools they can prescribe to each student. One-to-one computer initiatives make this kind of personalization possible as do flipped classroom approaches. Technology can be used to consume information or it can be used to create, communicate, and collaborate. For teachers who live by doling out information and expecting students to regurgitate it back, technology looks like an excellent knowledge provider. The standardized tests feed the consumptive use. To take better advantage of technology teachers have to shift their role from provider to facilitator and many aren’t interested. If you believe that students construct knowledge as they navigate a learning environment, using technology to do projects and make things should accelerate learning over the passive consumption approach. But many schools don’t allow students to bring devices to class and many also block sites such as YouTube that offer many opportunities. Innovative schools have students blogging and creating their own YouTube videos. The rise of Maker Spaces has also allowed for more creativity and creation. Students who put their work online can also get more feedback than any teacher can provide. This entry was posted on Saturday, April 1st, 2017 at 7:06 am	and is filed under Book Summaries, Education Books, Leadership Books. You can follow any responses to this entry through the RSS 2.0 feed. You can leave a response, or trackback from your own site.